I love stop-motion animation. I’ve always loved stop-motion animation. I always will love stop-motion animation. My job in the visual effects industry, working with CG day in and day out makes me love it even more. So when good stop-motion comes along, it’s always appreciated. This does not disappoint. The Pirates! : Band of Misfits comes out of Wallace and Gromit’s Aardman Animation. Despite the lack of presence of W&G creator Nick Park, the tradition and style of humor lives on with Peter Lord, who co-directed Chicken Run with Park, and who has always been an executive producer on all the Aardman stuff, including last year’s wonderful Arthur Christmas. And despite the partnership of Sony Pictures Animation, the character work is kept to traditional stop motion and the CG is kept to FX, water, and presumably cleaning up animation rigs. 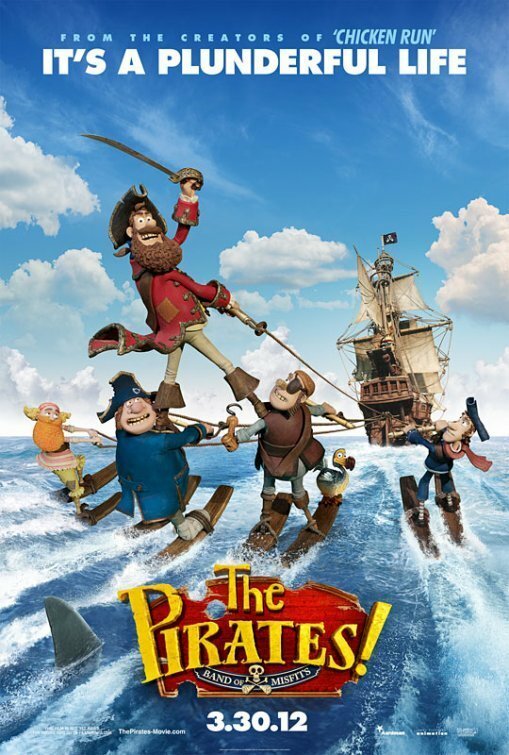 The film is based on the first in a series of novels, but as a novel it is called The Pirates! In An Adventure with Scientists. In fact, this is what the film is called in the UK, and presumably in every other continent outside of North America. This makes sense considering the rest of the series all start with “In An Adventure With…” Napoleon or Ahab or The Communists. So, Great Britain is all set for sequels. The U.S. Film market in all of its foresight and genius changed the name to not only something that doesn’t make much sense, but doesn’t lend itself to a series of movies. Some studio exec probably exclaimed “Scientists!? No one wants to see a movie with scientists! !” — thus perpetuating the steady decline of America’s potential to ever be an innovative world leader. The same confusion happened with Harry Potter and the Philosopher’s Stone. I’m sure that American publishers said “Philosopher? What’s that? Change it to Sorcerer — who doesn’t know what a sorcerer is? Every one loves Sorcerers!” — not that it affected book or ticket sales. The novels are not tailored to children. In fact, the humor is filled with irony and references that may completely go over the heads of kids under the age of 12 or so. The film, for the most part is filled with a similar tone, and it certainly has enough base humor to get the kiddies to laugh. But what bothers me is the absolute inability for the studio marketing department to figure out who the demographic of the film is. “It’s animated” = “It’s a kid’s movie”, which is often the case, but not always. Marketing people should know the difference. In fact, I THINK The Pirates! demographic are the same people who watch 30 Rock and The Family Guy, with the exception that The Pirates! doesn’t have to depend on 80s cultural references. Instead, a great deal of its humor is based on historical knowledge. Sure, you can laugh at the silliness, but its even more satisfying when you can laugh at the idea of Charles Darwin having to dup a pirate out of his dodo bird in order to gain accolades from his scientist peers, in turn, in order to get chicks. The Pirates! even falls into the popular “flashback” punchline that drives the sitcoms as of late where the joke is set up in a “Remember when we did that?”, and then a whippan reveals the situation, and then a whipan back to “Yeah, I didn’t realize — blah blah”. At this point, the most overused comedy style since using the word “REALLY! ?” when one is befuddled by someone’s stupidity. The film starts out in London, 1837 with the camera craning back through a large window overlooking the city. As we pull through, a character outside the window turns back, and blinks in surprise and ducks down behind the pane. Was he looking at us, breaking the fourth wall? Was he a crew member? Was he a worker on the ledge of the royal palace? Who knows. It doesn’t matter. But someone took the time to plan and animate it. In a very subtle way, this sets the tone of the film — unexplained absurdity. Here we are introduced to the large and tough Queen Victoria, and we find out just how much she hates pirates. Jump to our heroes — The Pirates! — led by The Pirate Captain, who breaks up a fight amongst his crew started with an argument over what is best about being a pirate. And what, according to the The Pirate Captain IS the best part of being a pirate? That it’s Ham Day! This is what we are in for the rest of the film — and it’s always delightful. The Pirate Captain’s primary goal is to get the coveted Pirate of the Year award — something that has eluded him for years and years, and given the fact that he has never won it, this year he must have a really good chance. Every decision he makes is to find a way to win the award, to the point where he must weigh just how important the award is — and what he’s willing to lose to get it. Peter Lord takes us through the typical storytelling rollercoaster, and he is able to bring us to a point, despite all of the mayhem, where we care about The Pirate Captain and his crew – The Pirate With A Scarf, The Albino Pirate, The Pirate With Gout, The Surprisingly Curvaceous Pirate, and The Pirate Who Likes Sunsets and Kittens. It is a testament to Lord and his animators that they can elicit more empathy from the audience toward small puppets of plasticine than Kristen Stewart can pull in her furrowed-brow acting style. All the characters are likeable or despicable, but we feel something for each — and that includes Darwin’s silent monkey, Bobo (like our staple Aardman non-speaking character — Gromit). The movie isn’t going to be for all audiences. First, the “I don’t watch kid’s movies” group is going to miss out. Second, the audience that doesn’t appreciate the leading comedy shows on TV now. Third, people who don’t like period films. But! If you like absurdist British humor, pirates, ham, monkeys, or psychotic queens with a taste for rare meat, then you, like me, will probably gain a bit of joy! I will bet my face on it!